Hi all, Nicky here, calling in from Kitchen Sanctuary. 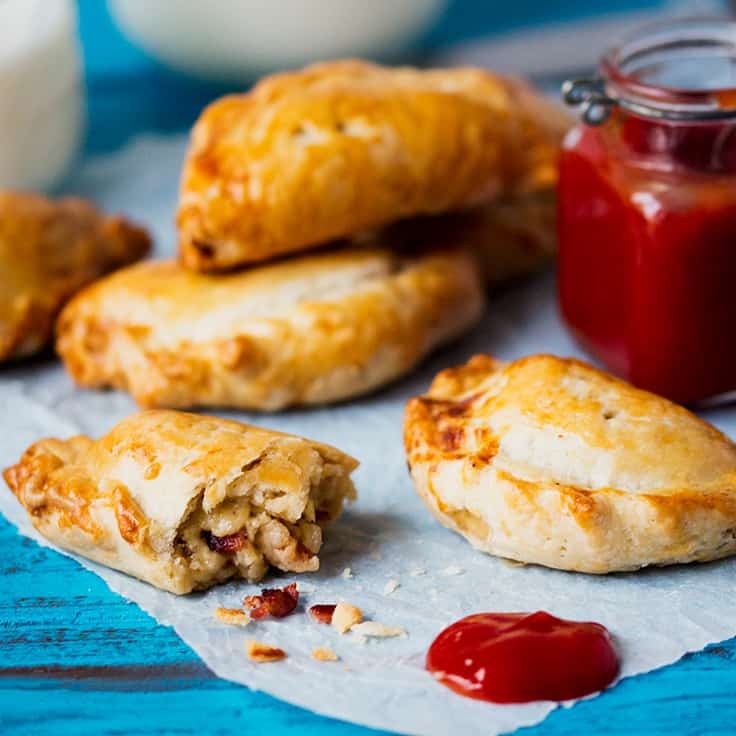 Today I’m bringing you a recipe for little cheese and bacon hand pies. 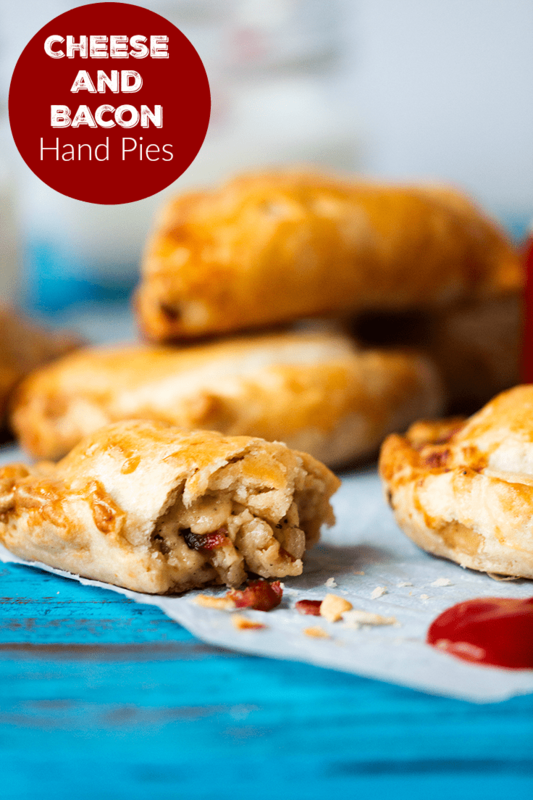 They’re comforting and delicious served warm, and they also make a great cold treat in your lunch box. I love writing these recipes for you guys, and figuring out some of the terms you use for recipe info (compared to us British folk) always gives me an interesting challenge! Imperial and Volumetric measurements – I’ve used lbs, cups and oz’s in this recipe. Did I get those right? Anyway, coming back to the recipe. The pies are quite small – just big enough for a child’s lunchbox (you’ll need two for the grown-ups). Eaten straight away, the cheese is gooey and delicious. They can also be cooled, wrapped and stored in the refrigerator until the next day. A lovely homemade treat for the start of Autumn. You might also like these Bacon Wrapped Water Chestnuts. 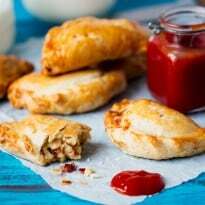 Would you eat your hand pies hot or cold? 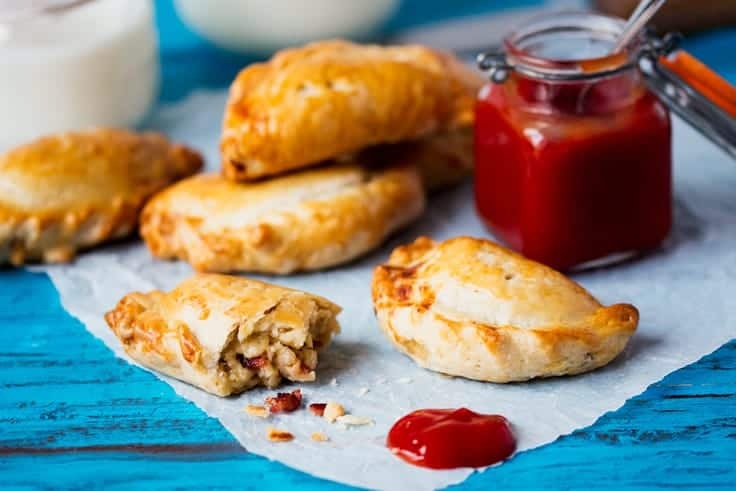 Ooey, gooey recipe for Cheese and Bacon Hand Pies. Comforting and delicious served warm plus they also make a great cold treat in your lunch box. Heat the oil in a skillet and fry the bacon until sizzling and lightly browned. Remove from the pan with a slotted spoon. Add the onions to the pan and cook for 4-5 minutes until softened. Sprinkle the onions with the flour and stir well to coat. Add the milk and cream and heat the mixture over a medium heat for 3-4 minutes, stirring continuously, until the liquid is smooth and has thickened slightly. Add shredded cheese and stir well. Add the bacon back in and season to taste with salt and freshly ground black pepper, stir well, then set the filling mixture aside. Take the pastry sheets out of the wrapping and unroll. 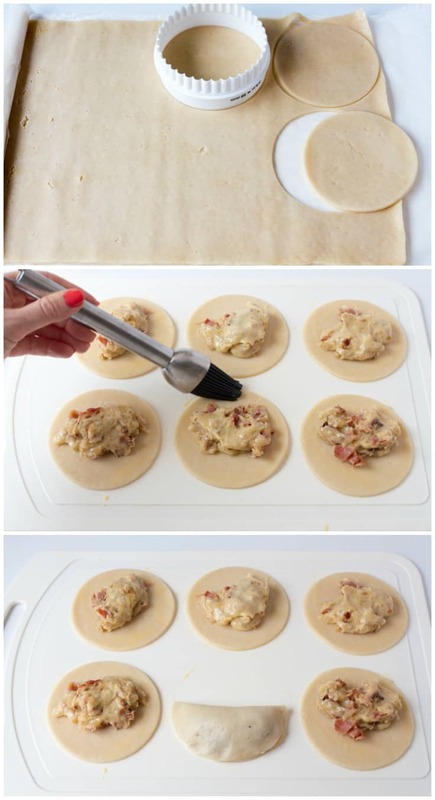 Use a cookie-cutter or a glass with a 4 or 5 inch diameter to cut circles of dough. You should get approx. 10 circles. Place a tbsp. of filling into the center of each pastry circle, then brush the perimeter of the circles with a little of the whisked egg. Fold over each circle to give you a half moon, and press the edges down. Twist or crimp the edges to make sure they stay sealed and place the pies on a large baking tray. Brush the tops of the pies with egg wash (if you find you have any holes in the pastry, just plug them with a little leftover pastry – using the egg wash as ‘glue’). Place in the oven and cook for 18-20 minutes until golden brown. Eat immediately, or serve cold. These sounds like they would be a very tasty treat. Thinking they would be good too if you made them a little smaller for appetizers. Doesn’t get any better than this!!!! I love bacon and cheese, a great combination. I really like this recipe and want to make it for my family! It looks so delicious and fun to make. I like that you already use pie crust and I do not have to make it! Thanks for the recipe! I can not wait to try these! They sound & look so yummy!! 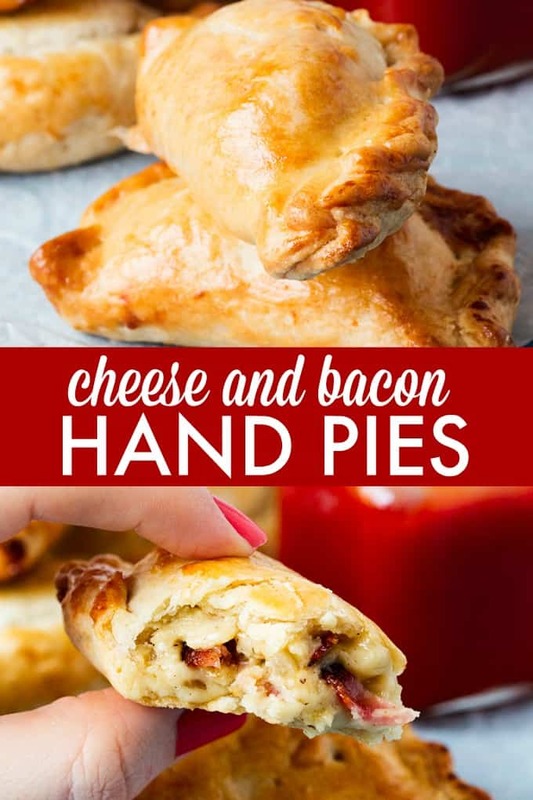 wow I love hand pies and never thought of savor pies esp cheese and bacon lemme at ’em!!! I want to try this! I hear you Stacie 🙂 I often have to convert/translate things too. It took me ages to find out that cornflour was corn starch, spring onions were green onions etc etc in Canada, there are so many things that get a different name it gets confusing at times. 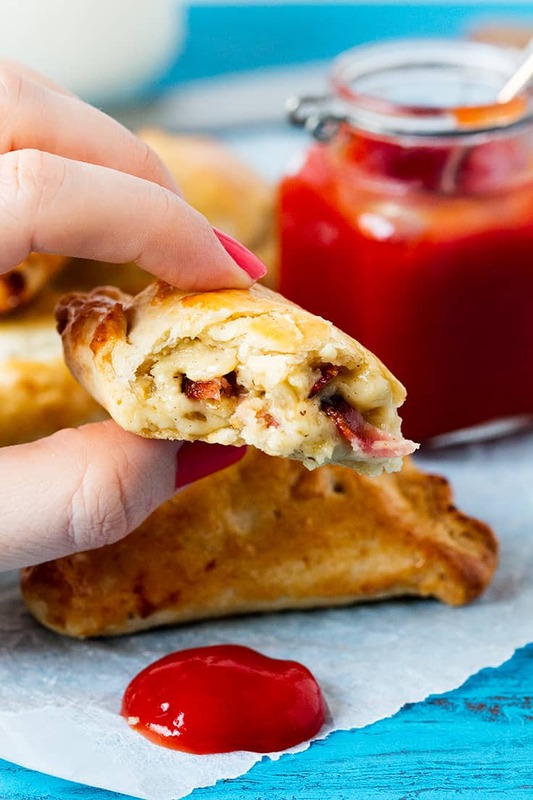 These look really really good, you can’t beat bacon and cheese, these would be great hot or cold, the perfect finger food!! These look delicious. Just printed the recipe!! WOW! That looks amazing! My hubby would love this. These sound really delicious. Thanks for the recipe! They look so good. Nice to know you can also eat them the next day. Printed and pinned, they look delicious, awesome for Friday movie night! 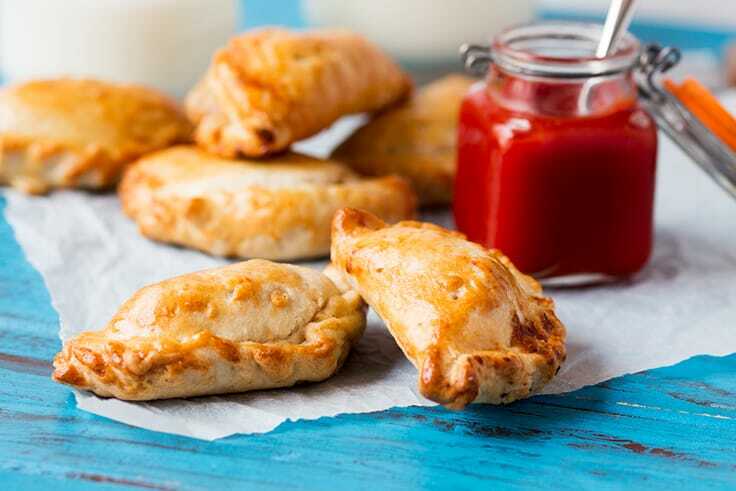 Do you have a good calzone recipe?? The bacon and cheese looked so good, I’m going to make it this coming weekend. I thank you so much for the share. I love cheese and bacon together. This I have to try. Many thanks for the recipe, Nicky! Going to try this during the Holidays! STOKED you linked up at Creative Mondays! These look amazing! I’m sure my family would eat these up, hot or cold. These look very simple. I pinned it so I can try it some time. I have a blog dare/link up over on my blog and I would like to invite you to post this link, if you like. Have a great day. Those look delicious! Pinning for later. I have been trying to find recipes to make ahead for a show I an hosting for my son`s future wife. These are great thank You. 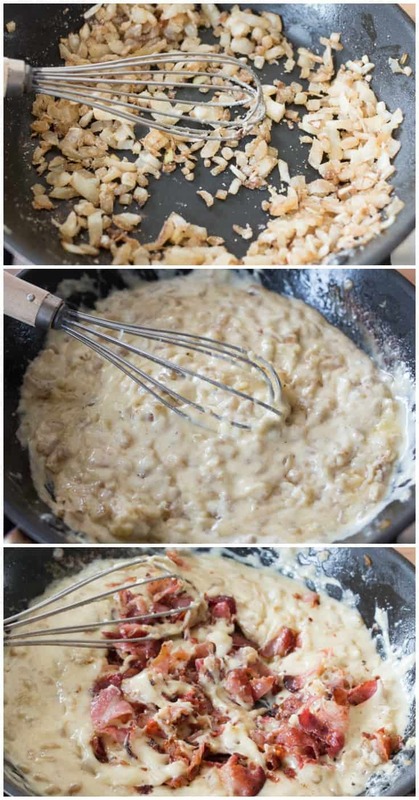 Wow, cheese and bacon…this has to be a eat!